I’m sure we’ve all seen the commercial – the soft-folksy sound of the guitar, and shots of baby animals covered in oil. And then we see this shot. Someone washing the otter as he hangs onto the edge. Heartbreaking I tell you! Gets me every time. 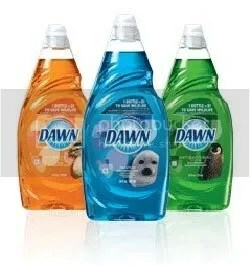 And Dawn’s slogan is 1 Bottle can=$1 TO SAVE WILDLIFE. How can something that helps to save animals be wrong? I needed to try it. Plus, all I could think of was that otter’s paw clutching the edge. So I headed to the store and looked for the special bottle (there are 3 different bottles: a seal, duck or penguin). No otter sad to say 😦 I picked up the seal (blue bottle).